Currently viewing the tag: "Kingdom of Sorrow"
We can argue about what the dividing line between metal and hard rock is until the cows come home, involve the cows in the argument until we feel like steaks, and then argue over some rare 16 oz. deliciousness and a wonderful glass of Cornet. But a satisfying conclusion will never be reached. 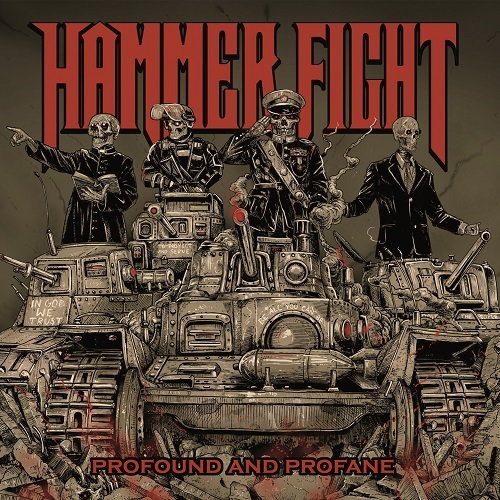 New Jersey’s Hammer Fight and their sophomore record Profound and Profane are intent on making this fight even more difficult by walking the dividing line with the precision of a man who’s just consumed fifteen beers and is intent on doing a balancing act using the lines in the dive bar parking lot. Regardless of genre tags, what we’re all concerned with here is whether or not Hammer Fight is the life of the party or the unfortunate soul who pukes in the punch bowl and falls asleep on the staircase.